Pictured are some basic fire kits I made for my older three boys, Father and brother for Christmas. I wanted to make the kit compact but encompass more than most kits do. I put everything in a metal tin (similar to an altoids tin) and included a fero rod, 6 ft of jute twine, a piece of chert and a steel striker I designed, made and heat treated. I used 1095 steel to make the striker. I drilled an indent in each striker so that they can be used as a baring block for the bow drill, primitive friction fire starting technique. I made all the edges 90 degrees so that the edges can be used to scrape wood for fine shavings or be used to scrape a fero rod. The tin can be used to make char cloth. They have room to add char cloth as well as add some quik tinder or other modern tinder for fire starting. Hopefully sometime soon I’ll be able to sit down and teach them all how to start a flint and steel fire. I did teach my older son, who was excited when his first try was a success. I’m sure they’ll be addicted to starting a fire in the wilderness this way, just as I am. Flint and steel is by far my favorite way to get a fire going. What’s your favorite fire-starting method? Have you ever used flint and steel or any primitive friction methods? I added some pictures of me heat treating the steel strikers in my simple forge. Here are some simple stocking stuffer ideas for the camper, bushcrafter or outdoor enthusiast in your life. Cordage (550 or 850 paracord, 1000# Paramax, bank line or even Jute twine which can also be used as tinder for starting fires. These are just a few ideas for those that are not sure what to throw in their outdoor enthusiasts Christmas stocking. There are plenty of other small useful things that will fit in a Christmas stocking but if you are not sure what to fill that stocking with feel free to use this list to help you out. What outdoor themed things are you putting in a Christmas stocking this year that may not be on this list? 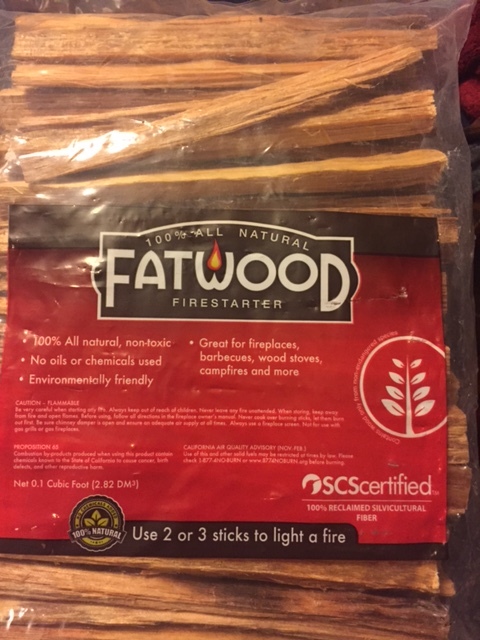 Home Depot, as well as some other stores, sells bags of Fat Wood in their fireplace sections during this time of year. Grab a large bag for around $5-$6. You can add a few pieces to your fire kits or emergency bag for quick access to some good quality dry tinder. You can even add a small bundle to any outdoor enthusiasts stocking and I’m sure they will thank you. When you’re ready to use it just shave it down and add a flame or spark from a ferocerium rod. So pick some up and give it a try! I’m not one for promoting deals I’m running on my website here on my blog but I thought the current deal was worth mentioning. 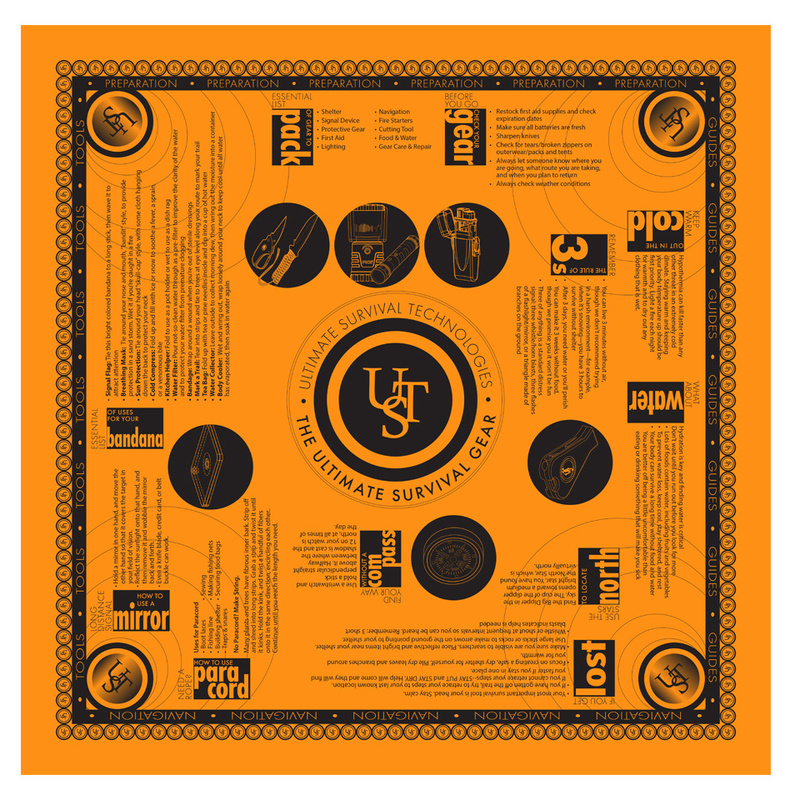 Now through December, with every purchase of $25 or more, you will receive a UST orange survival bandana. These are no ordinary bandanas. Printed on them are many survival tips that can be very useful in the event of a survival situation. These would be great for kids or adults that are lacking in survival/camping knowledge. There’s the obvious many extremely useful ways to use a bandana but now you would also have many survival tips that you wouldn’t necessarily have to remember or have to call back to memory in a survival scenario. This is just a great way to take something you may already be carrying and make it even more useful. Also, all orders in the continental U.S. will receive free standard shipping through December. Just click on the store button and place an order of $25 or over to receive your free bandana and free standard shipping. Hope everyone is doing well and getting the chance to enjoy the great outdoors. When putting together an emergency fishing kit try using braided fishing line instead of mono. If you’ve ever tried to straighten out that emergency fishing line in any of the small kits available on the market today you know it’s a feat in itself to get it untangled and to try to ever get it straight again. Braided fishing line can take being wound up tightly unlike mono line can. Also the braided line is thinner in comparison to the mono for the same pound test line. If you ever need that emergency fishing kit you made you’ll be happy (jumping for joy) that you chose to use braided fishing line over mono. Which fishing line do you prefer, braided or mono, for an emergency fishing kit and why?